Hey Everyone! Want to learn how to play drum set, congas, bongos, timbales, African drums, steel drums and mallets?!!! Come join us for World Percussion this year, starting Dec 1st! Rehearsals will be 9-1 on most Saturdays, culminating in multiple end of the year concerts at school and throughout the community. Come learn music from Jazz greats like Pat Metheny and Herbie Hancock, or popular music greats like Paul Simon and Bob Marley, just to name a few. Also, seize an opportunity to learn indigenous traditional drumming from Ghana, an opportunity only possible at Universities with large percussion programs, and here!!!! Check out the links below to "drum up" some excitement. Send your checks to Karen Wolf at PO Box 508, Wrentham 02093 or place in her mailbox at the high school in the band room or pay via Paypal by clicking on the following button. Please note, if paying by Paypal or credit card, you will be charged a "tax" of $7.50 so we can pass through the Paypal charges. Ryan Loud graduated with honors from UMass Dartmouth. He holds a bachelors degree in percussion performance with a focus in jazz and world music studies. After graduating, Ryan went on to teach as a percussion specialist at King Philip High School in Wrentham, a position he has now held for fifteen years. 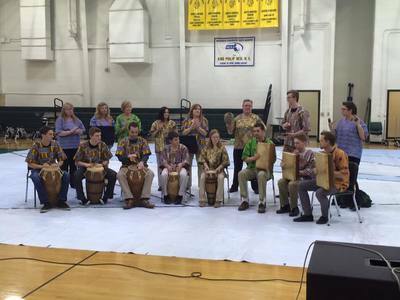 Upon arriving at King Philip, Ryan started a program called “World Percussion”. Unique to it’s kind in New England, students perform in a West African music ensemble, a Steel Pan ensemble, as well as study Afro-Cuban styles. Ryan also works as a percussion arranger, writing for a variety of schools and achieving a publication of an original work through “Tapspace” in 2018. Ryan was also a temporary professor at UMass Dartmouth from 2013-2015, teaching West African music. Ryan continues to perform professionally throughout New England on drum set, vibraphone and world drums. For the past 5 years the King Philip Steel Band has been a source of musical entertainment for the Pan Mass Challenge riders as they head down Cherry Street in Wrentham. The Pan-Mass Challenge is an annual bike-a-thon to raise money for cancer research and treatment at Dana-Faber Cancer Institute. The steel band lifts rider's spirits as they hit the halfway point of their first day of the event. They are treated to the musical sounds from a collection of traditional calypso, latin, jazz and popular music arrangements. The vibe of the steel band was enjoyed so much by the riders on Cherry Street, the band was invited to play the opening ceremony of the race in Sturbridge. The band played their 3rd opening ceremony this year on August 4th. The group is comprised of students and adults ranging in all ages. It is a group fully open to the community. World Percussion, is held on Saturday mornings starting in December and ending in May that begins the music learning process. The Summer Steel Band installment of the class from June -August completes the year. Both classes are separate enrollments. A Ghanaian Passion Adds to King Philip Pride! Just a taste of some of the exciting things World Percussion has brought to our music program. In 2016, we had the honor and privilege to study under two Ghanaian master artists, Attah Poku and Saeed Abbass. Both of these men are revered as some of the best drummers and authorities on Ghanaian music, dance and song. Having the opportunity to study this deeply rooted music is a privilege unto itself. Being able to study it directly from its cultural source is, in my opinion, a necessity in understanding it more fully. The opportunity to learn from Attah and Saeed was enriching not just to our musical knowledge but also to our sense of musical inspiration! Through active participation we were able to learn about three styles of music, stick drumming called, “Fontonfrom”, hand-drumming called, “Kpanlogo”, and the talking rope tension drum called the “Donno”. I could write on and on about both clinics but I would like to take a moment and describe one of them to you all in a bit more detail. Fontonfrom music from Akan culture in Ghana, is an old and very serious art form. Fontonfrom is a music that belongs to the royal courts of the Ashanti people. The Ashanti reside in south central Ghana located near the large city of Kumasi. All of Ghana is governed by a president since the forming of the nations independence in 1957, however, the Ashanti people still follow the rule and guidance of an elaborate system of chiefs, leading all the way up to a King and Queen. There are many forms of Fontonfrom music that belong to this royal lineage. As Ashanti music and dance is considered very sacred and held in such revere, they never shared it with anyone outside of their region. It was not until the 1960s that the Ashanti began to share their music with even the rest of the country. The formation of the “Ghana National Dance Ensemble “, in 1962, was a jumping off place for the sharing of all Ghanaian music within the country and eventually the rest of the world (interesting side note: the drums we used at the clinic were the original drums used in the first Ghana National Dance Ensemble!) In terms of Americans learning the music, it is not something that was done until recent years. Some styles are still kept only for African ears and hands. As I looked around the band room on Saturday morning, I came to a realization. In just the last year, Ashanti authority Attah Poku became a resident professor at Tufts University. This means that Ashanti music only recently became a common place in American Universities. As we are a high school, I realized that we are most likely the first high school to be given the opportunity to learn this music in the comforts of our own band room, by a master teacher who, when in Ghana, was the lead drummer for the King and Queen!! How lucky we are! So as I looked around watching the smiles from all the students and seeing these sacred drums being taught I realized that, we have officially made history! I would like to extend a tremendous thank you to Peter Tileston, Josh Wolloff, Michael Keough, and the KPMA for supporting this deeply educational and enriching side of the World Percussion Program. This music family is truly one of a kind!